Long, long ago, Packt sent me a copy of the book “Magento: Beginner’s Guide” by William Rice, and asked me to review it. I finally got around to it, and over the last few evenings have been reading this fine book. I just got done with it, and feel like I want to go set up my own store. 1) Table of contents organization – the chapters are obviously very well planned out. Rice carefully considered what a beginner would need to know, and in what order they would need to know it, then broke it into clear, digestible pieces. 2) Presentation of ideas within the chapter – Ideas are clearly presented, clearly explained, and then there’s a wonderful “What just happened?” summary that reminds you of the important parts of the instruction, and why they matter, so that you don’t end up lost as to what you did. 3) Voice – The voice in the prose is kind, patient, and not condescending like so many tech books. I felt like I was being helped by an expert, but one who knew how frustrating it can be to be talked down to. I have only two complaints about the book, and one of them is really a nit-pick. Now for the real one. The installation chapter is very strongly geared towards web hosting providers who offer a web-based pointy clicky configuration tool, and folks who either don’t have a web-based “control panel”, or have one that’s not described, may still feel a little at sea when it comes to doing things like creating a Mysql database. But, having gotten those two complaints out of the way, I have to say that this is probably the best-written technical book I’ve read this year. I highly recommend it, and, having read it, also highly recommend Magento as a web commerce solution. As I’ve mentioned before, we’re using CakePHP for our development at work. Cake was the first formal MVC framework that I’d worked with, although at Asbury we had developed an MVC framework in house, almost unbeknownst to us. That is to say, we developed a sane web app framework, and weren’t aware that someone had already given a name to the pattern. Shame on us for not doing our research a little better. Also, the other half of the web team had started working with RoR before I left, but I didn’t really look at it seriously. CakePHP is one of many PHP MVC frameworks, and, naturally, there are a variety of opinions as to which one is the best. I can’t claim to have done a careful comparison. How did I choose Cake? I like to hire people smarter than myself, and trust their judgement. This was the recommendation that came up from that team of smarter people. And I certainly have to admit that Cake really works with the way I think, and is very much the effect that we were trying to achieve with our framework at Asbury. We didn’t quite get there, but we were headed very much in the right direction. 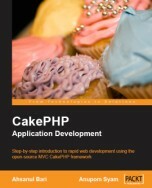 The CakePHP book from Packt Publishing was very helpful as an overview of what was possible. It has practical examples of what can be done, and has careful explanation of each step. In conjunction with the amazing online documentation, it provides a solid footing for jumping right in to writing Cake apps the first week. One place the online docs are sorely lacking is the V part of MVC. The online docs are for programmers, not for designers – or perhaps “written by” is the better thing to say there. Either way, the section about views and layouts is still rather weak, although it’s being worked on. The Packt book is a good supplement to this, although it makes more sense on second reading, after a little hands-on experience with the Views stuff. In short, recommended. 4-out-of-5-stars. Anupom and Ahsanul have done a good job of giving an introduction to Cake app dev in this book, and I’d recommend this as a desk-side reference as you start developing in Cake. As to the other frameworks – yes, I’ve heard that there’s others that are better. One thing that is obvious, looking at the various frameworks, is that all of them are crazy active – they are all improving by leaps and bounds, and pretty much every feature comparison I’ve looked at is way out of date, and inundated by comments saying “yeah, that’s how it was 6 weeks ago, but you should take a look now!” So I’m pretty sure that the jury is still out on this, and that there will be still several years to watch these things before one emerges as a clear leader – if, indeed, that ever happens. It hasn’t in any other language (with the exception of Ruby) so I don’t know why we’d expect it with PHP. 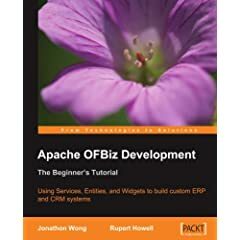 About 2 months ago, I was sent a review copy of “Apache OFBiz Development“, and have been trying to find time since then to do a review of it. I was also sent a PDF of Chapter 10, which you can read here. For those of you who listen to FeatherCast, you may remember hearing an episode on OFBiz that we did back in December 2006. A lot has changed since then, including OFBiz becoming a TLP within the Apache Software Foundation. TLP stands for Top Level Project, and refers to the status that a project obtains when it is no longer under the supervision of the Incubator. OFBiz is an Open Source framework for developing ERP and CRM systems. If you don’t know what ERP and CRM are, or if you don’t have at least a decent knowledge of Java programming, OFBiz probably isn’t for you. And, for that matter, this book probably isn’t. Although titled “The Beginner’s Tutorial”, keep in mind as you read that it’s referring to being a beginner at OFBiz, not a beginner to these other concepts. The book dives right in to installing OFBiz from SVN. It’s pretty clear from this chapter that installing and configuring OFBiz is not for the faint of heart. As soon as Chapter 3, we’re being shown how to make modifications to the core OFBiz source code, and given recommendations about keeping track of these for future upgrades. Although a certain familiarity with the MVC development methodology is useful, chapter 2 covers the rudiments, and discusses OFBiz’s take on it. After a couple chapters of nitty gritty stuff, the book settles into an example/solution tutorial, and is very effective in presenting practical, hands-on scenarios that demonstrate how the system woks, and how to get real results from it. As a side-note, every time I see OFBiz in action, I’m enormously surprised at how sophisticated it is, and how much work has obviously gone into it. Through the course of the rest of the book, example applications are built, and you can immediately begin to see the fruit of your knowledge. The prose is conversational, but direct and to the point, getting straight to the implementation details. Chapter 14 covers a variety of useful debugging techniques, from the log files to using a full debugger – very valuable content for someone new to this stuff. On the whole, I found this book to be an enormously helpful introduction to OFBiz development. While I admit that I’m probably not the target audience for the book, since my development is somewhat outside of the scope of this project, I was able to quickly understand the purpose of OFBiz, and see how it can be made useful.